This modification alters the browser window to be more space-efficient. The title bar has been removed and it comes with slim borders. The window has a small minimum size. All of the window content is compacted at the top with some extra features. - DrumsUI_browser_favorites.xml goes in your CustomUI folder. 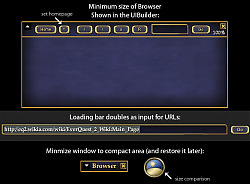 - eq2ui_mainhud_browser.xml goes in your CustomUI folder. - Now has 4 tabs and includes "Favorite" dropdown. Editable from DrumsUI_browser_favorites.xml! Sounds like the browser itself having issues. Will look into it. This issue exists at the browser level, it's not UI relevant (also tested against Fetish and stock). Last edited by shenala : 10-30-2013 at 12:35 AM. I really like your browser mod. It would be greater still if it had updated links and favorites, and the hyperlinks in Web pages worked all the time. 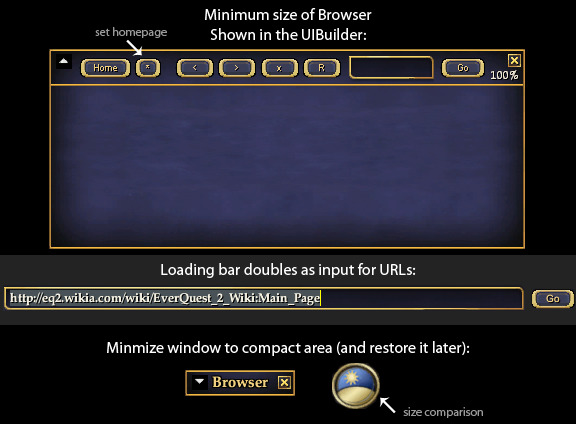 That's right, about half the time a link (such as in eq2.wikia.com) does not function. I honestly do not know if it is the browser itself or your mod. 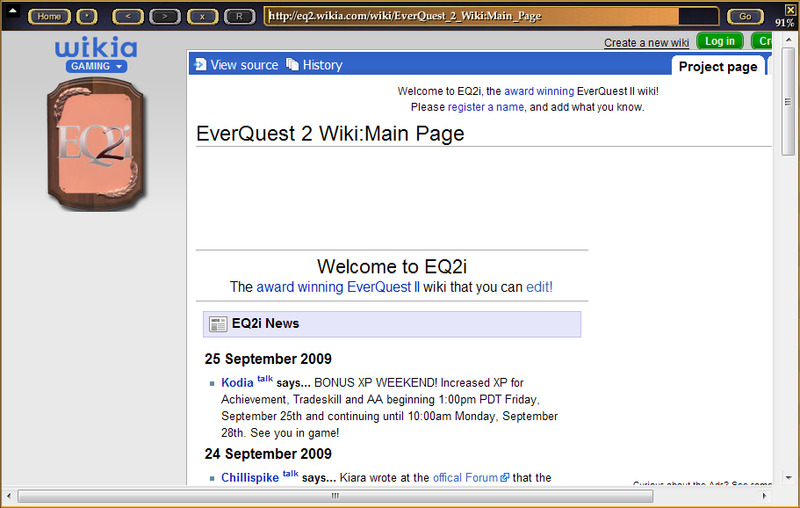 Thanks for your EQ2 contributions! Not sure why it's missing, but I'll look into it soon. Where is the minimize button?? Drum - LUV your UI/pieces. What happened to the minimize button on your browser mod? While it's all well & good to have the browser remember & go to the last page viewed when ya close & reopen, it was so much simpler and more convenient when you had that minimize button. Bring it back, Drum, bring it back! Currently I am using this and have noticed that - intermittent usage of this will Crash EQ2. So far I haven't seen any pattern as to why but eq2 only crashes when using this mod. 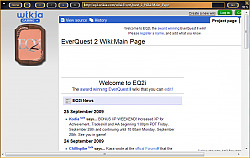 Both EQ2 and the os (Windows 7 x64 Ultimate) have recently been installed (In the last 2 days) so I am sure this isn't a OS/EQ2 Configuration/Corruption issue. Any ideas on what may be causing this? The in-game browser is a beast of it's own. Some people have trouble with it crashing, others don't. Sometimes it can be uncommon other times it always happens. Personally I have no suggestions for you. You might try the official forums. Is there anyway to enable right click menu's in the in-game browser? Under Steps: Line 1. After inspecting the relic, speak to Dror Ironstein ( -232, 214, -191 ) (copy link icon) in West Fort Irontoe in Butcherblock Mountains. The place where is says (copy link icon) can not be right clicked to copy the way point. Right after ( -232, 214, -191 ) there is a little icon the looks like 2 windows if you right click it and click copy you can go in-game and in your chat hit ctrl+v and it will paste the way point this would be easier if it could be done from the in-game browser. any help would be great. Don't think so. You'll have to resort to highlighting the box it says to right click, or the location itself and use the keyboard shortcut Ctrl+C to copy and Ctrl+V in-game to paste it. Glad you got it working mate. Almost seems like an apostrophe in there (maybe in one of the links or lines of code) might be screwing something up, but I'm really not sure. You could try removing the comments at the top of the file and test it. Lemme know what you try if you could. Thanks! I got your new Browser to work perfectly now with some minor changes. But first to explain why I think I had some problems. I use about 70% of ProfitsUI and the remainder DrumsUI. I believe Othesus' browser and favorites may have been fashioned to Profits but not certain. So what did to maintain the integrity of your browser, which I love, I made the following changes. <Dropdownbox DataSource="FavoritesDS" DropBy="600" Location="297,11" Name="FavoritesDropdown" OnHoverIn= etc…..
<Dropdownbox DataSource="BookmarksDS" DropBy="600" Location="297,11" Name="BookmarksDropdown" OnHoverIn= etc…….. There were a total of eight areas I made the above changes to. I have no idea why the booksmarks.xml would have such an impact on totally unrelated UI windows. But the above changes WORKED! Last edited by Accredo : 05-04-2010 at 08:22 PM. I eagerly downloaded your new browser today and gave it a test run. However; my compass, experience bar, target/implied and hotbar changed to the EQ default. When I removed the DrumsUI_browser_favorite.xml the windows reverted back to the custom ui I have been using with Othesus' browser. But your Browser using your eq2ui_mainhud_browser.xml worked fine except for the favorites which of course would be expected. There's is something in the favorites.xml that is changing the above ui windows which should or I would assume are unrelated to either the browser or favorites xml's. Using Othesus' two xml's have no effect on the above. I don't believe I have anything else of Othesus installed that I can remember. I even tried changing the <include>DrumsUI_browser_favorite.xml</include> in your favorite.xml to <Include>eq2ui_mainhud_browser_bookmarks.xml</Include> (Othesus's xml) to see what effect that would have but the drop down only appears as an artifact. I tried the reverse with Othesus's xml in your favorites.xml but nogo. Re: Re: Re: Re: Bookmarks? Yes it is. DarqUI Threat/Detrimental Window with C2C has the audible ques but for me it locks my hotkeys for some reason after one use. I tried everything but still nogo, but that's another story. I use your C2C stuff and thought the audible Detrimental (configurable via EQ2's stock available sounds) would be a great add-on. Last edited by Accredo : 04-25-2010 at 09:40 AM. I love your browser but have reverted to Othesis for the bookmarks. Any chance you'll be adding them sooner than later? On another note: Have you considered adding audible capabilities to your C2C UI? Haven't investigated the audible stuff yet. What's that, when you get a counter for a debuff it plays an audio file? ?